Ishiro Honda is the man best known for directing the first Godzilla movie (Gojira) and many of the Godzilla films that followed in the Showa era (1964-1980). A humble and quiet man passionate about the films he made but also a man loyal to his company (Toho). A man who expressed his wartime experience and encounters with the atomic bomb through a man in a giant rubber reptile suit. But this is not a review of Honda's films; this is a review of a book written about his films. Firstly be warned that this book seems to be meant as a companion to Honda's films. That is, each chapter was written with the intention that the reader would read it shortly after watching the film of which the particular chapter is dedicated to. There are no plot outlines, summaries, or even synopses, so if you haven't watched Honda's films in a long time (or indeed have never) then this book is not for you. I, on the other hand, read each film's chapter directly after watching the film, which is how I recommend this book be read. There is a very nice biography on Honda in the beginning that takes up a great deal of the book's first half; this serves as a fine introduction to Honda's filmography. There exist no other published English biographies of Honda so this is definitely something worth reading. Indeed it'd even be a struggle to find books about Honda's films. Of course it's a bit easier a task to find books written on the Godzilla franchise, but even many of those are Japanese-only publications and many that aren't are long out-of-print and will cost quite the sum to obtain. Fortunately this book is very easy to obtain and is one of the only of its kind. 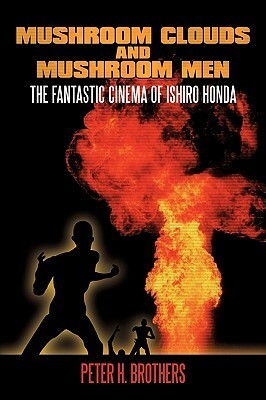 Unfortunately Peter H. Brothers didn't live up to the potential of writing the perfect book on Honda and his films. Brothers is clearly very passionate about his writing and clearly loves the films he's writing about (indeed his "Reverberation" of Honda at the end of the book is very heartfelt and probably my favorite part of the book), but his writing is very dull and dry and the author never achieves a distinct voice. His analyses are detailed (he'll talk for pages about a film's music or photography), and I'm sure Brothers' research consisted of watching each film over and over and seeking out the rarest of writings on Honda from internet articles to obscure Japanese magazines from the 1950s, but none of them ever come together into anything substantial. And in the end you're left with a few cool bits of information, a few chunks of what could be an interesting interpretation, but really that's all. Not to mention that there is an unfortunate amount of spelling and grammatical errors that the work sometimes seems sloppy. I have even heard (from those more informed than I) that there are even some factual errors present. The chapters on the films tend to get very repetitive as well (to be fair, the films are kind of repetitive in themselves). A lot of the chapters feel the same, discussing the music, the photography, etc in very much the same way as the last. It's not a bad work. It's worthwhile simply because not many other publications on this subject exist. Even in its disappointment it remains great for fans of Godzilla or Ishiro Honda or for those who seek a companion for them. At the very least it shows Honda in a very sympathetic light and honors him in such a way that he deserves to be honored: with love.Somewhere lost between a 2.0 and a 2.5. Exhaustive book covering the biography of Ishiro Honda, director of Godzilla films and his entire filmography. Honda was an oddity in the directing world; he seemed to be a nice, if quiet and passive director who had managed to direct one of the most influential films ever made; Godzilla, King of the Monsters. The first part of the book is his biography, and the rest are histories and criticism of all the films he directed. The tone is dry, and the book is massive. But if you're a Godzilla fan, it's an excellent resource. Some of the best parts are how Brothers highlights the themes Honda had running through his movies, which over time made up almost an inner universe of the man. You see connections and elements that carry over between the films, and really understand Honda as a director.For non-fans, the book is a tough sell. It's massive, and the section on the films don't sum up what each one is about. It's best if you have a working knowledge of all his movies to read the criticism on it. The prose isn't the greatest either, as it's workmanlike at best. But for fans though, it's a great resource. Best bought in ebook, as the price is less, and you'll want to quick search specific movies to read the chapters after you watch one. While this title serves as a prime example of the need for proofreading in the ebook industry, it is nevertheless a compelling look at a director who was a staple of my childhood (though I didn't necessarily know that back then). Brothers provides a fascinating entry into the life of Ishiro Hondo (also known as "The Father of Godzilla"), and does a wonderful job of describing the highs and lows of his career and films (though, in the case of the latter, it sometimes seems like he's more interested in writing about Akira Ifukube instead). All in all, if you are interested in Godzilla, the kaiju genre, or just Japanese SF and fantasy films in general, this book is worth your time. This sounds like a fantastic read, and it started that way, but there are parts of the text that are either jumbled up or missing every few pages (at least in the first 10% of the book) that make it impossible to follow; it seems like a truly horrible OCR job. Very sad, because Honda is one of my favorite directors. The first 60 pages was a pretty good biography of Honda, a company-man studio director ground down by the increasing juvenility of the Godzilla movies. However, the rest of the book is write-ups of the individual films that don't have any plot summaries and thus if like me, you last saw most of the Honda movies when you were 8, this part is nearly useless.